This is damn funny. Sad, but funny. Some interesting "firsts" culled from Usenet a/k/a Google Groups. "Mister President, tear down that wall...of dirt"
Sometimes a pile of dirt is more than just a pile of dirt. (Guy + cell phone + free long distance) / (too much free time) + 867-5309 = Jenny, Are You There? It's tiny...and I like it that way! When size really does matter, you may want to check out My Favorite Smallware over at MarkTAW.com. And while you're there, check out, ohhh I don't know... just about everything else the guy has ever posted. Thank God Josh is out there reading comics so we don't have to. 'Cause if I have to follow the Family Circus dotted line tracing Jeffy's travels from school to home one more time, I'm gonna lose it. ...You know, because of the long face. 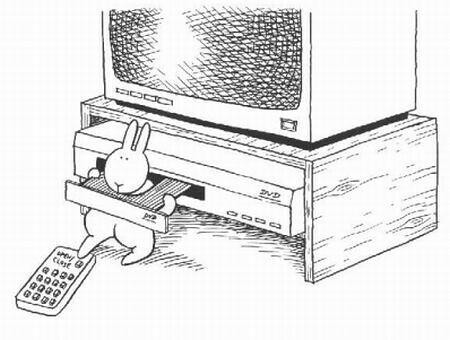 Who knew it was the bunny who was so depressed? The What-If-inator: Random 'what ifs' to inspire stories and games. 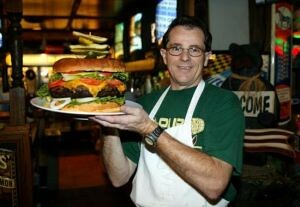 You may have seen the story of a Pennsylvania pub that serves an unusual item on the menu: a six-pound hamburger. It run $23.95, but they offer to pick up the tab if anyone can eat it in under three hours. Since its inception in 1998, no one was able to collect. But then Kate Stelnick brought in her appetite. Kate, 19, is a 100-pound college student that conquered Ye Olde 96er (6lbs = 96 ounces) in 2 hours 56 minutes. In addition to the meat, contestants much eat one large onion, two whole tomatoes, one half head of lettuce, 1 1/4 pounds of cheese, two buns, and a cup each of mayonnaise, ketchup, mustard, relish, banana peppers and some pickles. Hmm... You think she's any relation to Mr. Creosote? Behind-the-scenes reporting on competitive eating. 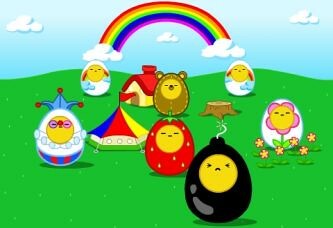 After visiting ILoveEgg and listening to the I Love Egg song, the third word outta your mouth might be "hey" or "heck" or "hell" or even the F-bomb, I just don't know. What I do know is that the first two words are guaranteed to be "What" and " the..."
Every click, every missed note, every flubbed drumbeat, every off-mic "Yeah!" from every Beatles album at What Goes On. Some interesting tidbits in here if you're willing to sift through some of the more obsessive-compulsive notation. More of the same, only with Led Zeppelin. 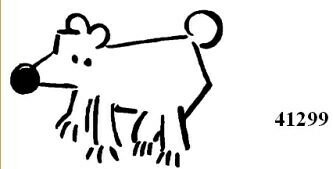 Usually, I am happy to confine my content-lifting to the internet. Today, however I'm making an exception and hijacking an idea from a whole 'nother medium: print. This week's Time magazine has a little sidebar on magazines appealing the some of the sins of the flesh. Modern Drunkard Magazine has some of the coolest retro/pulp/classic artwork I've seen in ages. All In covers the soon-to-collapse-under-its-own-hype poker craze. For those who think of Botox as an essential food group, there's New Beauty, where the focus is on better living through plastic surgery. Hey John Woo, I'm seeing some good ideas for Face/Off 2 here! It's The End Of The World As We Know It... Again. History of people who have prophesied the Big One. Lots of content. Hope we have time left to read it all. The chew toy?! You can't handle the chew toy! Pets In Uniform - Only $19.99! 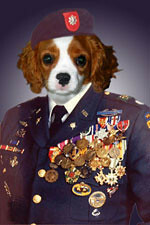 "Imagine: your dog, cat, or other pet in full military regalia. I make this fantasy a reality. Using the latest digital techniques, I combine a photo of your pet with the uniform and background of your choice." More numbers, less wazoo at combinationlock.com, where you use mathematical clues to try and open the lock. Hint: the Easy levels are probably a little too easy. If so, click the More Puzzles link to crank up the difficulty factor. Urinals - If you've been up nights tossing and turning, burning and yearning to know just what the urinals in the Los Angeles Zoo or in Creative Friends Quilt Shop (Hollister, CA) look like up close and personal-like, now you can rest easier, my obsessive-compulsive friend. Urinal.net shares your thirst for porcelainous urinary collection devices. Um, maybe that's not such a good metaphor, considering the subject matter. But they do have hundreds of pictures of nothin'. But. Urinals. Go figure. 666 - Eli Eshoh is a little overly interested in finding 666's. You know, The Number of the Beast. Also explorations into The Square Root of the Beast, Cube of the Beast, Fraction of the Beast, The Right Triangle of the Beast (no, really... stop giggling! ), and how "Windows 95" turns into 666 after you, uh, you know, change it to "Windows 96". Or something. Plus how the end of the world is coming... in 1998.Plus oh-so-much more than you really want to know. Cats - Pictures of cats. Just pictures of cats. Cute cats, ugly cats, cats in funny hats, you get the idea. The first twenty or so pictures you're saying, "Awwww, look at the cute kitties!". This wears off as you view the next four hundred pictures of cats. Whether you agree or not with the above quote, Jason Gross has compiled his list of some of the best of 2004's music journalism, as well as some of the worst. 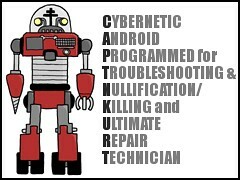 Get your own custom T-shirts and mugs emblazoned with your mecha-moniker at the Cyborg Name Generator site. 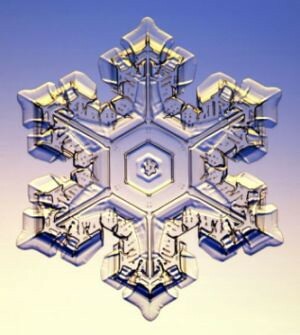 More pictures of snowflakes than you can shake a stick at. Assuming you would want to shake a stick at a snowflake, that is. I ask you, which of these is creepier? 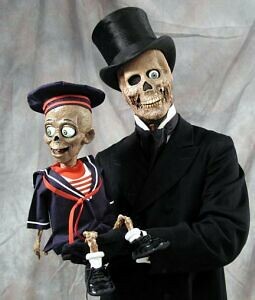 A) Mr. Deadguy and Baby Cheezwitz? 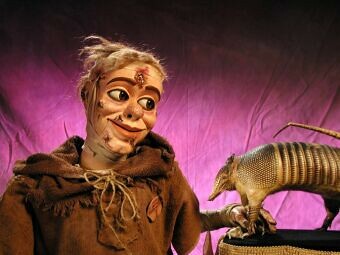 B) Scabby Hansen the Leper Boy? 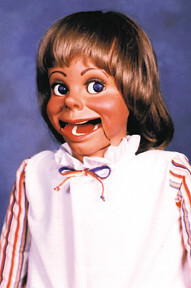 C) Generic female ventriloquist doll? Yeah, I vote for C, too. Why is that? Fun bonus game! 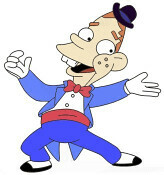 Try and sing along with Gabbo without moving your lips. Need some pointers? Ventriloquism secrets revealed here! When you absolutely need to relive the superb dialogue from A Nightmare on Elm Street 4, or if perusing the pilot of Who's The Boss gets you all misty, TV and movie scripts can be had at Simply Scripts, Movie-Page and the granddaddy of them all, Drew's Script-O-Rama. How to play euchre. 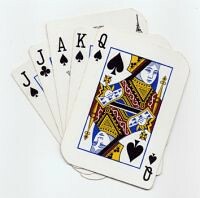 Euchre phrases and terminology, strategies, and a "what would you do?" quiz. Oh, plus Peuchre: The Euchre Drinking Game.